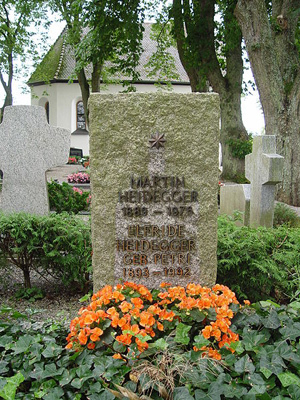 Martin Heidegger (1889-1976) was born September 26th, 1889 in the Black Forest region of Messkirch. He began gymnasium1 at Constance in 1903, but was later transferred in 1906 to Bertholds gymnasium in Freiberg. He took up studies to be a Jesuit by entering the Society of Jesus at Tisis, in Austria -- likely for health reasons, he was rejected as a candidate. Heidegger then decided to study for his priesthood at the Albert-Ludwig University in Freiberg, where he began lecturing and publishing papers. Here he first encountered the writings of Husserl, and was also directed by his superiors to change his studies from theology to mathematics and philosophy. Heidegger embraced the change -- studying closely the work of Husserl and completing his doctorate -- The Doctrine of Judgement in Psychologism -- in 1914. The following year he completed his habilitation with his dissertation -- The Doctrine of Categories and Signification in Duns Scotus. At this time, in March of 1917, he married Elfride Petri -- shortly thereafter Martin joined the German army. He thrived in the army and was promoted from private to corporal within ten months, but had to be discharged for health reasons. Shortly after the birth of his son, Jorg, in 1919, Heidegger, in a letter to a colleague, confessed that he had decided to break with the dogmatic system of Catholicism. Heidegger was born on September 26, 1889 in Messkirch in southwest Germany to a Catholic family. His father worked as a sexton in the local church. In his early youth, Heidegger was being prepared for the priesthood. In 1903 he went to the high school in Konstanz, where the church supported him with a scholarship, and then, in 1906, he moved to Freiburg. His interest in philosophy first surfaced during his high school studies in Freiburg when (at the age of seventeen) he read Franz Brentano's book entitled On the Manifold Meaning of Being according to Aristotle. By his own account, it was this work that inspired his life-long quest for the meaning of being. In 1909, after completing high school, he became a Jesuit novice, but was discharged within a month for reasons of health. He then entered Freiburg University, where he studied theology. However, because of health problems and perhaps because of a lack of a strong spiritual vocation, Heidegger left the seminary in 1911 and broke off his training for the priesthood. He took up studies in philosophy, mathematics, and natural sciences. It was also at that time that he first became influenced by Edmund Husserl. He studied Husserl's Logical Investigations. In 1913 he completed a doctorate in philosophy with a dissertation on The Doctrine of Judgement in Psychologism under the direction of the neo-Kantian philosopher Heinrich Rickert. The outbreak of the First World War interrupted Heidegger's academic career (albeit briefly). He was conscripted into the army, but discharged after two months because of health reasons. Hoping to take over the chair of Catholic philosophy at Freiburg, Heidegger now began to work on a habilitation thesis -- the required qualification for teaching at the university. His thesis, Duns Scotus's Doctrine of Categories and Meaning, was completed in 1915, and in the same year he was appointed a Privatdozent, or lecturer. He taught mostly courses in Aristotelian and scholastic philosophy, and regarded himself as standing in the service of the Catholic world view. Nevertheless, his turn from theology to philosophy was soon to be followed by another turn. Heidegger gained notoriety quickly as a phenomenologist, under the guidance of Husserl. Martin became his assistant in 1919, and would later succeed him as professor of philosophy, at Freiburg. He lectured and made a colleague of Karl Jaspers, continuing a dialogue with him for many years. During this time, Heidegger's second son, Hermann, was born. By 1924, Heidegger was promoted to become an associate at the University of Marburg, where he would write his most recognized work, Being and Time (Sein und Zeit, 1927). He was coerced to rush the publication of the book to retain his position at the University of Marburg. In his most important and influential work, Being and Time, Heidegger is concerned with what he considers the essential philosophical (and human) question: What is it, to be? To even ask the question, remarks Heidegger, implies that at some level the answer is already understood. As a student of Husserl, Heidegger felt that Husserl's thinking was trapped by its relationship to a concept of God and the transcendent. Heidegger shifts the mode of the subject undergoing phenomenological investigation by immersing it into its own contemplation as a being both within language (time) and within the world, hence, between a concept of being and time. Modern philosophy had forgotten the question of Being and had become concerned with the ontic (or factual existence), missing that which makes such an understanding of beings possible: between the "is-ness" (Being) and being as the subject of discourse or self-reflection. Heidegger argues that ontology as phenomenology must necessarily be hermeneutic, or interpretive. Truth is always both concealing and revealing. When one interpretation is opened up, other interpretations are necessarily closed off. In this sense, ontology is always provisional. Heidegger describes the quality of Being in the concept of Dasein. The subject is thrown into a world that consists of potentially useful things, cultural and natural objects. Because these objects and artifacts come to humanity from the past and are used in the present for the sake of future goals, Heidegger posited a fundamental relation between the mode of being of objects and of humanity and the structure of time. The individual is always in danger of being submerged in the world of objects, everyday routine, and the conventional, shallow behavior of the crowd. The feeling of dread (Angst) brings the individual to a confrontation with death and the ultimate meaninglessness of life, but only in this confrontation can an authentic sense of Being and of freedom be attained. Dasein is a consciousness of the thrown quality of being between concepts that form the reality of the present, and the concern for the safety of the subject into the future. Dasein in this sense is a consciousness of consciousness. Being comes into existence at the limit of the thrown-ness of everyday existence between past and future. After writing Being and Time, Heidegger later had a turn in his thought. This work anticipates hermeneutics (i.e., Gadamer) and post-structuralism (i.e., Foucault, Derrida, Levinas). In such works as An Introduction to Metaphysics (1953), Heidegger turned to the interpretation of particular Western conceptions of Being. He felt that in contrast to the reverent ancient Greek conception of Being, modern technological society had fostered an instrumentalizing attitude that had deprived Being and human existence of meaning, a condition he called nihilism. Humanity had lost its true vocation; to recover a deeper understanding of Being that was achieved by the early Greeks and lost by subsequent philosophers. In 1933, Heidegger was appointed the rector of the University of Freiburg. At this time, he also joined the National Socialist Party. One year later, Heidegger would resign as rector due to disputes with faculty and local Nazi officials. 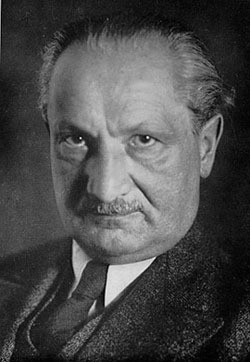 Heidegger continued his involvement with the National Socialist Party until 1945, although the degree of his involvement is still under debate. Despite the urgings of Marcuse and others, Heidegger never publicly apologized for his involvement with National Socialism. With the de-nazification hearing in 1945, Heidegger was banned from lecturing and teaching at any university by the French Military Government, and furthermore ruled that the university refuse Heidegger Emeritus status and pension him off, stripping him of his professorship. Though he continued to write and speak, he suffered a nervous breakdown in 1946. He applied for, and was granted, emeritus status, providing that he would refrain from teaching. In 1947 he published On Humanism to distinguish his phenomenology from French existentialism. By 1950, Heidegger was reinstated to his teaching position, and, one year later, he was made Professor Emeritus by the Baden government. During the next decade he published a number of works including: An Introduction to Metaphysics (1953), What is Called Thinking (1954), What is Philosophy (1956), and On the Way to Language (1959). During Heidegger's arrest from teaching, he found a collaborator, Medard Boss drafting, Existential Foundations of Medicine and Psychology, which would become a seminal work in existential psychology. Heidegger hoped that Boss' application of his philosophy to psychology would help those in need of aid, as well as bring his thought to a larger audience. Throughout his career, Boss would continue to promote a Daseinanalytic approach to psychotherapy and medicine. Heidegger's original treatment of such themes as human finitude, death, nothingness, and authenticity led many to associate him with existentialism. Indeed, his work had significant influence on the French existentialist Jean Paul Sartre. Heidegger, however, eventually repudiated existentialist interpretations of his work. Since the 1960s his influence has spread beyond continental Europe making quite an impact on Western philosophy. Heidegger's life entered a problematic and controversial stage with Hitler's rise to power. In September 1930, Adolf Hitler's National Socialist German Workers' Party (NSDAP) became the second largest party in Germany, and on January 30, 1933 Hitler was appointed chancellor of Germany. Up to then virtually apolitical, Heidegger now became politically involved. On April 21, 1933, he was elected rector of the University of Freiburg by the faculty. He was apparently urged by his colleagues to become a candidate for this politically sensitive post, as he later claimed in an interview with Der Spiegel, to avoid the danger of a party functionary being appointed. But he also seemed to believe that he could steer the Nazi movement in the right direction. On May 3, 1933, he joined the NSDAP, or Nazi, party. On May 27, 1933, he delivered his inaugural (rector) address on The Self-Assertion of the German University. The ambiguous text of this speech has often been interpreted as an expression of his support for Hitler's regime. During his tenure as rector he produced a number of speeches in the Nazi cause, such as, for example, "Declaration of Support for Adolf Hitler and the National Socialist State" delivered in November 1933. There is little doubt that during that time, Heidegger placed the great prestige of his scholarly reputation at the service of National Socialism, and thus, willingly or not, contributed to its legitimization among his fellow Germans. That being said, just one year later, on 23-Apr-1934, Heidegger resigned from his office and took no further part in politics. His (rector) address was found incompatible with the party line, and its text was eventually banned by the Nazis. Because he was no longer involved in the party's activities, Heidegger's membership in the NSDAP became a mere formality. Certain restrictions were put on his freedom to publish and attend conferences. In his lecture courses of the late 1930s and early 1940s, and especially in the course entitled Hölderlin's Hymnen "Germanien" und "Der Rein" (Hölderlin's Hymns "Germania" and "The Rhine") originally presented at the University of Freiburg during the winter semester of 1934/1935, he expressed covert criticism of Nazi ideology. He came under attack of Ernst Krieck, semi-official Nazi philosopher. For some time he was under the surveillance of the Gestapo. His final humiliation came in 1944, when he was declared the most "expendable" member of the faculty and sent to the Rhine to dig trenches. Following Germany's defeat in WWII, Heidegger was accused of Nazi sympathies. He was forbidden to teach and in 1946 was dismissed from his chair of philosophy. The ban was lifted in 1949. The 1930s are not only marked by Heidegger's controversial involvement in politics, but also by a change in his thinking which is known as "the turn" (die Kehre). In his lectures and writings that followed the turn, he became less systematic and often more obscure than in his fundamental work, Being and Time. He turned to the exegesis of philosophical and literary texts, especially of the Presocratics, but also of Kant, Hegel, Nietzsche and Hölderlin, and makes this his way of philosophizing. 1Gymnasium -- pronounced with a hard g in several languages -- is a type of school with a strong emphasis on academic learning, and providing advanced secondary education in some parts of Europe and the CIS, comparable to British grammar schools and American preparatory high schools. It usually refers to secondary schools focused on preparing students to enter a university for advanced academic study.